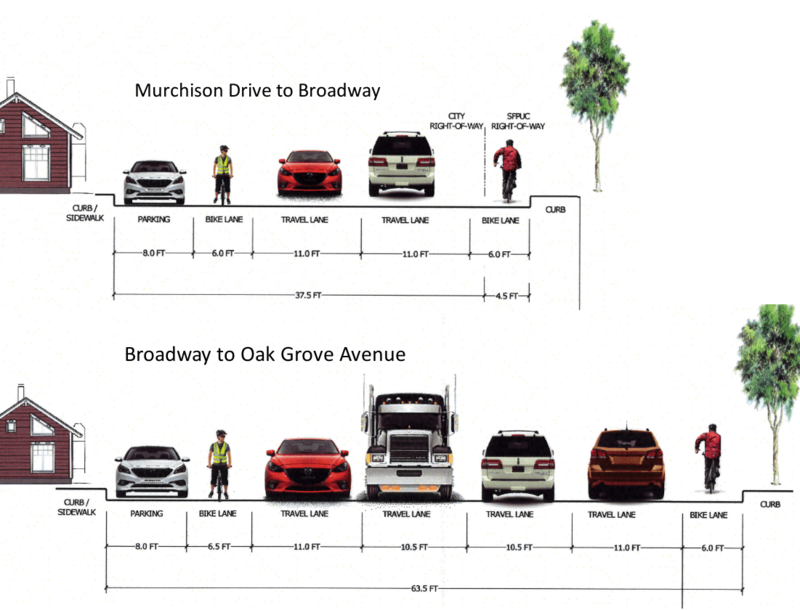 As a result, a project to install two miles of standard bike lanes on California Drive connecting the Millbrae BART/Caltrain Station with Broadway Avenue in northern Burlingame was cut from the SMCTA’s draft funding list [PDF]. Money for crosswalks, pedestrian refuge islands, yield lines, curb ramps, and sharrows on streets leading to Sunshine Gardens Elementary School and El Camino High School in South San Francisco was also reduced from $504,000 to $461,464, leaving the city to make up the difference. Cities submitted applications for twenty safety projects totaling $9.3 million. SMCTA chose ten of those to split the $4.9 million in available funds, in awards ranging from $200,000 to $1 million. Crossing Highway 101 on foot or by bicycle will remain hazardous in most places for a long time, if SMCTA continues to block its more generous Highway Program from paying for any improvements intended to make walking and bicycling safe. 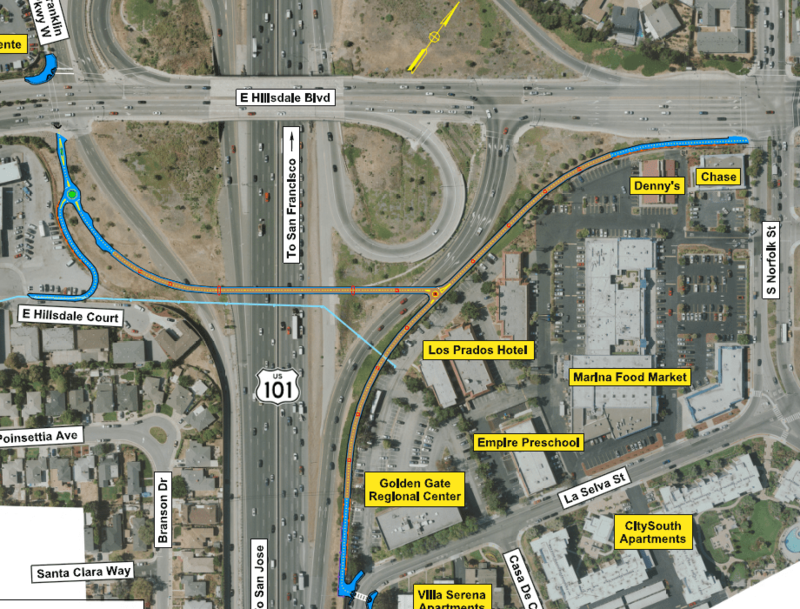 This year’s largest Pedestrian and Bicycle Program award was $1 million for a pedestrian bridge designed into a reconstructed interchange at Holly Street and Highway 101 in San Carlos, which needs another $2.1 million to get built. In October, SMCTA gave $11 million to rebuild the entire interchange except for the pedestrian bridge, while lavishing a total of $108 million on eight highway expansion projects. $882,036 of the Ped/Bike Program money was awarded to Belmont to construct new sidewalks, crosswalks, and bike lanes detailed in the city’s 2013 Ralston Avenue Corridor Study. A walking and biking path under Highway 101 connecting Bair Island Road with Main Street in Redwood City was awarded $500,000, while another $500,000 will go to wider sidewalks, curb extensions, and improved striping and signage on streets near Kennedy Middle School in Redwood City. Menlo Park will receive $490,000 to help pay for a pedestrian tunnel under the Caltrain tracks at Middle Avenue, Daly City was awarded $337,500 for crosswalk warning light systems, and the County itself was given $300,000 for a ped/bike path along Highway 92 to bridge a 600-foot in the Crystal Springs Regional Trail. The smallest awards were $275,000 for buffered bike lanes and pedestrian improvements on Alameda de las Pulgas in Woodside, and $200,000 to help pay for a road diet on San Mateo Drive between Peninsula Avenue and Baldwin Avenue in San Mateo. Cities applied for ten other safety improvement projects that won’t be funded at all, including a pedestrian bridge over Highway 101 at Hillsdale Boulevard in San Mateo, a sidewalk and bike lanes for Hillside Boulevard in Colma, a sidewalk along Hickey Boulevard in South San Francisco, a safe pedestrian crossing of Highway 1 using flashing beacons at 16th Street in Montara, and pedestrian refuge islands at University Avenue and Runnymede Street in East Palo Alto. That’s no skateboarder…that’s a cyclist in a jacket signaling he’s slowing down or stopping.